Colonel Garcia is in his 28th year of service with the AZARNG. He was born and raised in Flagstaff, AZ, completed High School in Mesa AZ and returned to Flagstaff in 1985 graduating from NAU in 1998. 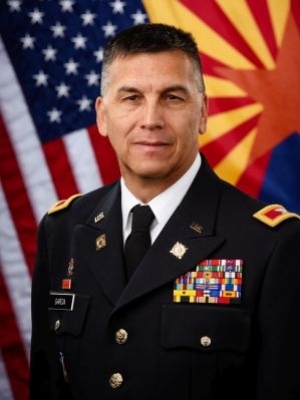 He commissioned through the Arizona Military Academy OCS program in 1989. Initial duty assignments included Ammunition Platoon Leader, Ordnance and Transportation Detachment Commander, 2220th Transportation Company Commander, 153rd Brigade Support Battalion Commander and many Battalion and Brigade level staff assignments. His General Officer Staff assignments include Mobilization Officer, Deputy G3, Deputy G1 and G1. COL Garcia participated in many exercises, training events and support to civilian authorities and the nation to include a National Training Center rotation, support to two NTC rotations, training in Jordan, South Korea, Germany, several State Active Duty missions and a deployment to Afghanistan during the surge of 2010. COL Garcia’s military education includes Ordnance Officer Basic, Transportation and Logistics transition courses, Combined Arms Services Staff School, the Command and General Staff Officers’ Course, and the U.S. Army War College. His civilian education includes a Bachelor of Science in Environmental Science and a Master of Strategic Studies from the U.S. Army War College. Military awards and decorations include the Bronze Star Medal, Meritorious Service Medal, Army Commendation Medal, Army Achievement Medal, Army Reserve Component Achievement Medal, National Defense Service Medal, Southwest Asia Service Medal, Global War on Terrorism Service Medal, Armed Forces Reserve Medal, Army Service Ribbon, Army Reserve Component Overseas Training Ribbon, Arizona Military Academy Ribbon, Arizona Extremely Long Service Ribbon, Arizona State Active Duty Ribbon, and Arizona National Guard South West Asia Service Support Ribbon.